The Croatian coast with clear and clean sea offers a variety of beaches. Adriatic that has numerous islands, bays and reefs hides mainly stone, gravel and sandy beaches. Hotel resorts are mostly located on the coast with nice beaches, often stone or gravel, while there is a smaller number of sandy beaches. Trees that are typical for this part of the Mediterranean will give you lots of shade. Some beaches are further equipped with various offers, slides for children, beach volley courts, and cafes and restaurants along the beach. There are numerous beaches in Croatia, and its numerous islands and hidden coves still hide undiscovered beaches, away from civilization and tourist crowds. Sandy beach Bijeca in Medulin is recommended for families with small children. Rabac, known as the "pearl of Kvarner" because of beautiful crystal clear sea and white pebble beaches. Clean beaches and bays and numerous islands, as well as many sport facilities are a symbol of Porec. Umag gives you a beautiful dynamic family or sport active vacation. Best beaches are: Vrsar, Valkanela, Koversada. Baska offers you unique pebbled beaches. Rajska plaza (Paradise beach) is one of Croatia best family beaches. Vespera: located in a sunny bay, in harmony with the forest. Two beautiful beaches in Moscenicka Draga are the main reason tourists return for many years. Coast of Crikvenica offers 8 km of sandy and pebble beaches. Zaton: The Blue Flag is arriving once again to Zaton beach. Soline is located in the shade of a think pine wood, near a sandy and pebbled beach. Zrće is the most beautiful and most attractive beach in Novalja. It is known world wide for its summer entertainment. Slanica has an idyllic sandy beach. Bibinje bays have beautiful and large beaches, and are among the most attractive parts of Bibinje tourist offer. 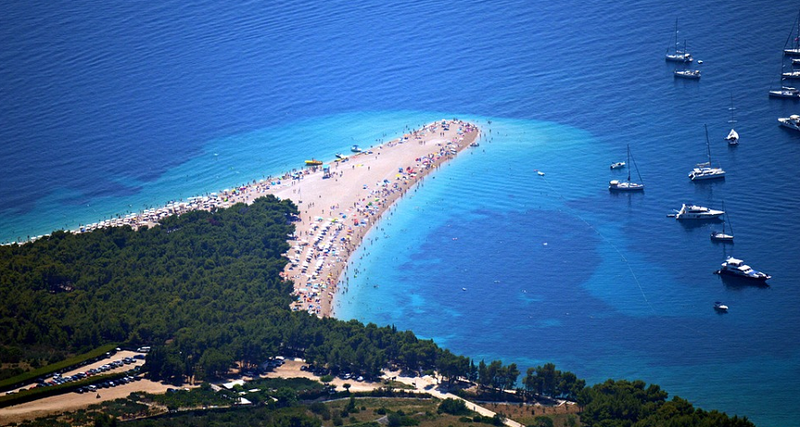 Zlatni Rat, a shape shifting beach, is one of the largest and most beautiful natural attractions of the Adriatic sea. Makarska: a city known for sandy and pebbled beaches. Bacvice beach is a cult playground for the game "Picigin", and the "World championship in Picigin" is held there yearly. Pakleni: playful islands in a clear, azure sea, several beaches, and many hidden bays. Always warm and clear sea, with a view on the open sea, city walls and the island Lokrum attract people from around the world to the beach Banje.